Long Island is all about the water. We’re surrounded by it. Beautiful beaches are everywhere and Long Island brides love the beach. 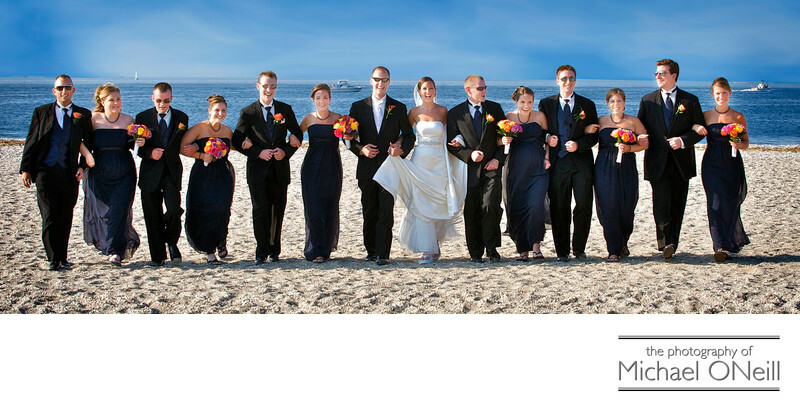 This fun picture of a bridal party walking in the sand was taken at Cedar Beach at Mt. Sinai Harbor, New York, but it could have been taken at any of the Island’s wonderful beaches. Long Beach, NY, in front of The Allegria Hotel is another popular spot. Land’s End in Sayville, NY has it’s own private beach for their guests. There are miles of oceanfront beaches in the Hamptons from The Oceanbleu in Westhampton Beach past dozens of miles of private beaches of oceanfront estates; all the way out to the beachfront at Gurney’s Inn in Montauk. On the north shore there are private beaches at The Crescent Beach Club and Carltun on the Sound in Bayville and beautiful waterfront photo locations at The Harbor Club at Prime in Huntington and Lombardi’s on the Sound in Port Jefferson. Wherever you choose to take your waterfront beach pictures on your wedding day you can be sure I’ve had the experience of creating great wedding images there. I’d love to take some of you and your bridal party, too.